Arunachal Pradesh State Transport Services Itanagar Station today felicitated its sincere and dedicated staff for their dedication on their duty and department. Addressing the felicitation ceremony, APST Itanagar Station Superintendent and I/c AGM (APST) Tuter Dolum said that ‘ it is day when we felicitating to the sincere and dedicated staff of Itanagar station for their outstanding performances apart of normal duty for the development and promotion of the department’. 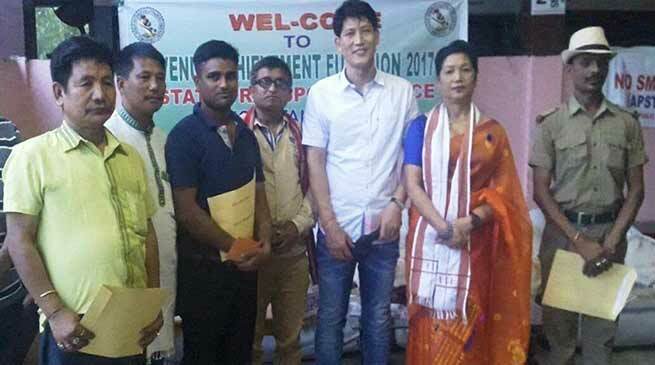 He said that State Transport Services, Itanagar conducted a Revenue Achievement function at STS, Itanagar premises in order to boost the enthusiasm of Employees. He said that the achievement of more than target is only possible with the coordinated efforts and sincerity with dedication toward their duty. He informed that ‘In 2016-17 Itanagar Station earned revenue of Rs. 35159280/- over Target of Rs. 31721272/- and 2017-18 achieved Rs. 35612172/- against the Target of Rs. 32695500/- and contributed a record revenue to the exchequer of Govt. Three dedicated and sincere staff of Itanagar station, Vidyapathi Thakur, Best Mechanic’ Dilip Biswas, Best Bus Driver & Bari Karlo, Best Conductor were felicitated with certificate and cash award of Rupees Five Thousand. In the function the staffs and their families displayed cultural programmes which enlightened the happiness of employees after a longtime.